The FlashLink Certified Vaccine Data Logger with Glycol Bottle is designed for monitoring temperature conditions inside storage units where vaccines and other temperature sensitive pharmaceuticals are kept. This reusable logger features a large, easy-to-read LCD and an external probe sealed in a 5mL glycol bottle. The glycol prevents false alarms by buffering the probe against sudden and expected temperature fluctuations during normal use, such as frequent door openings and cycling of the refrigerator or freezer. The glycol also emulates temperature changes experienced by most common fluids in storage, to give more accurate readings. The logger attaches to the outside of the storage door, while the sensor bottle is placed inside, allowing users to read current and minimum/maximum temperatures without opening the unit. A red LED alarm and low battery indicator are also visible on the display. Certificates are available for ISO 17025 and NIST calibration. 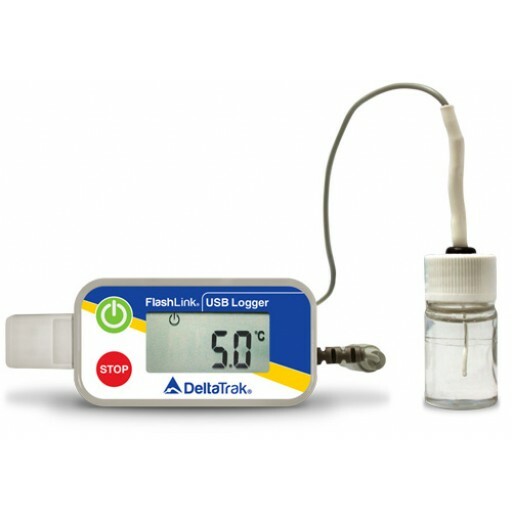 The FlashLink Certified Vaccine Data Logger with Glycol Bottle provides an accurate reading, programmable alarms and sampling intervals, and a USB connection to quickly and easily download temperature data. The FlashLink Certified Vaccine Data Logger with Glycol Bottle can be programmed to start automatically or with the option for a delayed start allowing the Glycol Bottle sufficient time to stabilize to the refrigerator temperature. Temperature data is easily downloaded and analyzed using DeltaTrak's FlashPDF Program Manager Software.